Nikki Van Dijk is an Australian world surfing champion, who participates in the World Surf League and is one of four global JEEP ambassadors. In 2019 the JEEP ambassador program commenced a new social initiative, “Make A Wave”, whereby each ambassador donates time and resources to make a difference. Each of the four athletes has the opportunity to chose which organisation they would like to connect with in their own community. 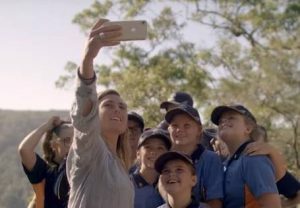 Nikki felt that Girl Guides Australia was the type of organisation she aligned to and that our mission to empower girls and young women resonated strongly with her journey as a female sportsperson. 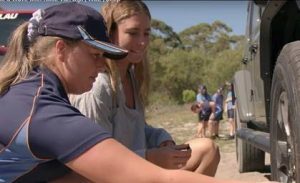 Working in consultation with Girl Guides Australia, the World Surf League and JEEP chose to film Nikki’s “MakeAWave” initiative on the beaches of Newcastle in NSW. In March Nikki partnered with Girl Guides from Cessnock District Guides for a fun filled adventure of high energy and enthusiasm, practising leadership, experiencing teamwork and friendship in the great outdoors.